After eroding more than 60 feet of vineyard contiguous to the Russian River near the Town of Geyserville in Sonoma County, the California Department of Transportation knew it was facing a problem. Facing risk to route 128 near the Geyserville Bridge due to the Russian River current, Caltrans set out to control the forces of the river, reduce threat to the bridge while meeting strict regulatory agency requirements, and provide additional wildlife habitat. Working with state and federal agencies as well as local stakeholders, Caltrans focused on innovative techniques to solve the problem, including using multiple graded rock that was installed without keying below the ground, re-vegetating by using site-collected willows and cottonwoods, and installing an "earthcam", a camera that allowed the agencies to review the work during construction and to continue monitoring the area after the project was completed. The work had to be done quickly and with little disruption to the river water, due to the migration of salmon and steelhead trout in the river. 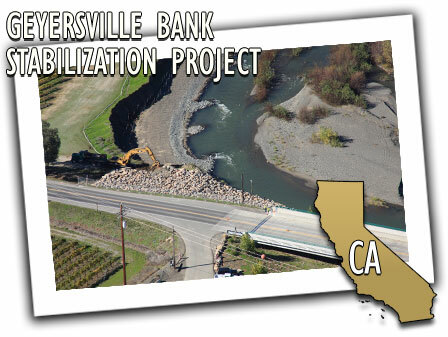 By using a perimeter siltation barrier, Caltrans was able to complete the construction in just two weeks. The entire project (from plan development to permit acquisition to project completion) took only 40 days. The final project allows the Russian River to flow in its natural pattern without eroding any more of the surrounding vineyard.